"Sure, what can I bring?" I’m sure you’ve asked that question many times after receiving countless invitations to barbecues, especially before a holiday weekend. Isn’t it great to have several go-to recipes that you’re comfortable with, so you can fulfill the host’s request without stressing out? Plus, you usually want something that won’t go rancid if it sits in the sun for a few hours. 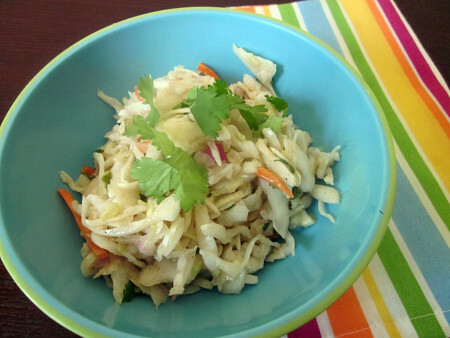 I love the cole slaw recipe I recently added to my blog, but I wanted to have another in my arsenal that didn’t include mayonnaise. Once again, Bobby Flay came to the rescue. This version is light, tasty and mayo-free, so no need to worry when it’s sitting out on the picnic table. Combine all ingredients in a bowl. Pour in vinaigrette and toss until combined. Chill until ready to serve. This entry was posted in Bobby Flay, make ahead, salad, side dishes. Bookmark the permalink. 2 Responses to "Sure, what can I bring?" I love the idea of a cole slaw with a vinaigrette instead of mayo. It looks so refreshing.